Ahhh YESSSS. I know you guys see me post about this heavenly spot on Instagram pretty often but I figured the best way for me to really give you guys a full break down on The Fairmont Grand Del Mar, where it is (5300 Grand Del Mar Court, San Diego, CA), THE VIBE, and WHY you neeeed to go visit ASAP...was through the blog. I debated started a travel section of the blog for a while because I don't coin myself as a "travel blogger" by any means. BUT I do think that sharing some of my favorite places with you guys is just necessary and I would love to fill you in on things like the spa, the food, what I order, the gym, the pool, and the drinks haha because duh...priorities. Also, I'm ALWAYS in workout clothes on the gram so this way I can also kind of give you a little insight on where I get like normal people clothing haha, okay...let's get into it. This hotel has been recognized by Trip Advisor Travelers as the Top Luxury Hotel in the COUNTRY. My boyfriend and I have been to this Fairmont Hotel like 10 times now and we always love each room a little bit differently. First of all... this hotel is a Forbes Five-Star and AAA Five Diamond luxury San Diego resort. The extremely beautiful and royal looking layout has been the same so far but the location is always different. Sometimes we're on the second floor with a balcony over looking the pool, other times we're on the first floor with a fountain and a view of the courtyard right outside so it's always going to be a win. I never ask to be anywhere specific because I love the surprise of what each new room brings. GUEST ROOMS: Okay so just to give you an idea..this is where my boyfriend and I always stay and it's BEAUTIFUL! I feel like a princess in this room. The marble bathroom is HUGE with an European-style soaking tub, a separate shower, 2 sinks, high ceilings, a vanity, a closet, a flat screen TV, and a separate area for the restroom. THE BEST PART? The shutters above the soaking tubs open all the way up like french doors into the rest of the room so you can make the space feel even bigger. This also allows me to have the bathroom to myself to get ready while having a conversation with my boyfriend is in the other room. The room itself is very relaxing and after room service makes everything look absolutely pristine, they leave us with 2 of the best cookies you've ever had in your life. An Oreo generously dipped in a delicious white chocolate. We always fight for these when we know room service stopped by haha. Then (of course) you have a tv, a desk area, and the sliding glass doors that open all the way up to a beautiful balcony that overlooks the green property. This room is plenty big for 2 people (we get a king bed when we go), but if we have more people, we love to stay in that room but swap out the king bed for two queens! Keep in mind that the average size of this room is 51.12 sq.mt. The Suites are obviously just on another level. They range in size depending on what you're looking for. Here's a look at the four different Suite Options. 1. Manchester Presidential Suite: This suite comes comfortably with TWO king beds and sits at 263.95 sq. mt. and the views from these rooms range from the Resort Grounds to The Golf Club. 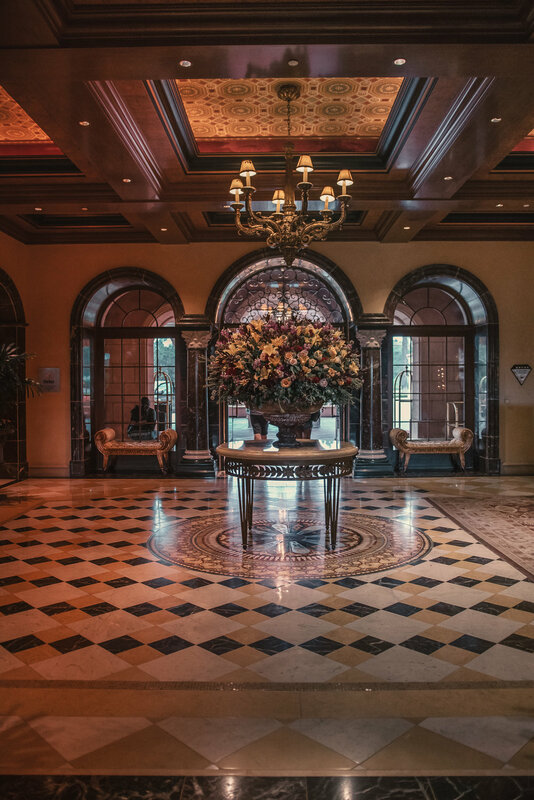 With only 2 Presidential Suites on the property, you can imagine that they are GRAND. They offer a living room with a fire place, free wi-fi, four 40-inch LCD TVs, a spacious balcony with stone fireplace and ample seating, dining table for eight with adjacent butler's pantry, powder room and dual master bedrooms. No big deal. 2. Palazzo Suite: This Suite has one king bed and a pull out bed that is located in the connected room. It is 139.41 sq. mt. and the views from these rooms are typically of the resort grounds. It has either 1, 2, or 3 bedrooms depending on your needs, a dining room table that seats 8, a fireplace, a kitchenette and two expanded terraces! 3. Toscana Suite: This Suite is slightly smaller than the Palazzo at 102.23 sq. mt. and offers beautiful golf course views! It also has one king bed plus one pull out bed in the connecting room, a fire place, a dining table for 6 people, a kitchenette, and an expanded balcony! 4. Prado Suite - This Suite is a comfortable 92.94 sq. mt. and has 1 king bed, plus one pull out couch in the other room with views of the resort grounds or the relaxation pool! It has a living spaces area and a separate sleeping area with dual bathroom that gives you that very spacious his and her's vibe that we all love. 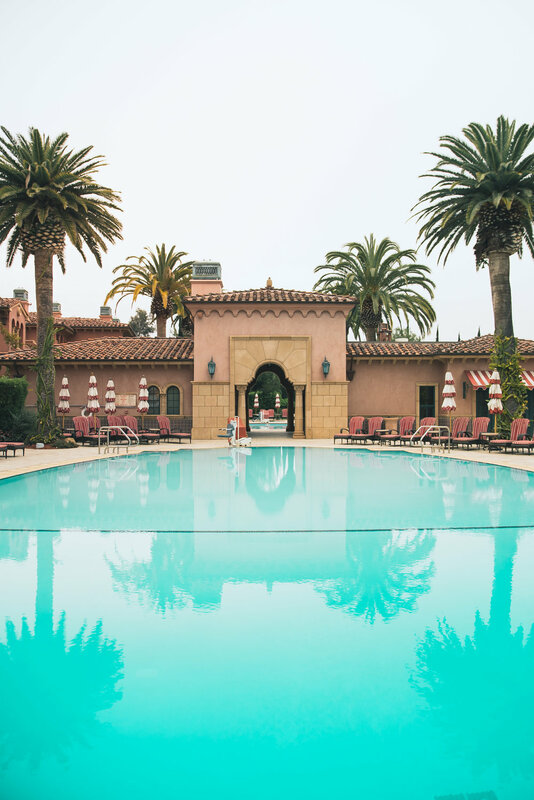 Whether I want to sit at a bar with my knees tucked into my chest eating a cheese plate and sipping on a martini or I want to throw on some heels and enjoy some pasta and wine outside OR just lay pool side with a glass of champagne and French Fries...The Grand Del Mar is prepared. The Hotel offers 3 restaurants, a lobby lounge, a cafe, afternoon tea, a club, a poolside bar and food menu and last but not least...epic room service. THE ADDISON: I mean, this is a Luxury Hotel so the Addison is the FINE FINE dining created by Relais & Châteaux Grand Chef William Bradley. 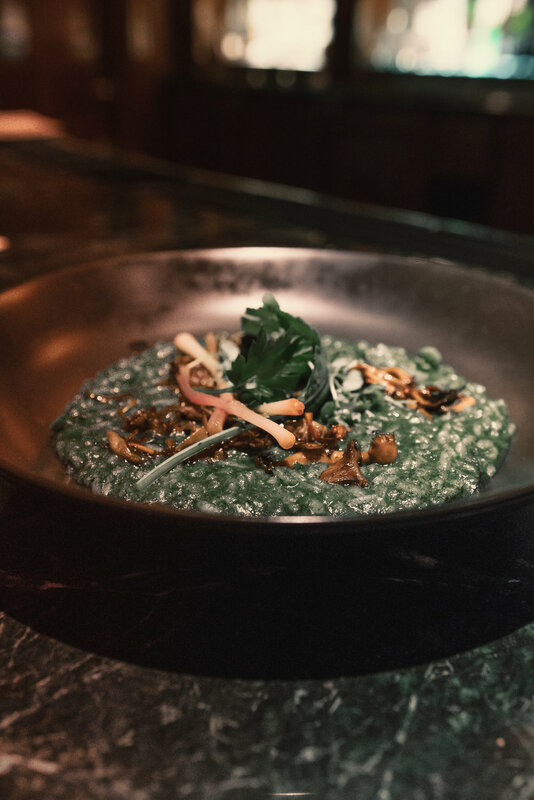 Together they use the influence of fresh ingredients and contemporary French influences to create a seasonal menu that is perfectly paired with the Grand Award-winning wine list of nearly 3,500 selections. Find more info on the Addison's hours of operation and book a reservation here. AMAYA - Ahh yesss, the beautiful indoor and outdoor restaurant that sits perfectly in front of The Grand Del Mar's Mediterranean-inspired architecture and never ending golf course. My boyfriend and I love to come here for breakfast, brunch, and lunch because the outdoor terrace is just so beautiful. Definitely the spot to be when you want to be outside enjoying some food and a glass of chardonnay. The bar within this restaurant is also a nice vibe that we're drawn to at night. They serve the full dinner menu and have a flat screen tv so you get the best of the fine dining and lounge setting. To rent out space at the Amaya, book a reservation or learn more about their hours, click here. LOBBY LOUNGE - Room isn't ready? FANTASTIC. I almost prefer that actually because girrrrlll there's nothing better than walking into this hotel after the drive from LA to my home town of San Diego and ordering an aperol spritz...or two. Honestly though, this lounge is FANTASTIC any time of day whether it's 1:00pm and you want a round of West Coast Oysters after check out, or it's 9:00pm and you want to hang in the library area and play chess while you wait for your dessert and espresso martini. We also love sitting in the lobby by the fireplace after the pool for a night cap because duh - who doesn't love a fire place moment? Click here for more info on hours of operation and live entertainment. CENT' ANNI - This is a cute little cafe located inside the hotel where you can quickly cruise in and out for a macaroon, coffee, organic iced teas, or food on the go. They provide pressed sandwiches, gelato, seasonal soups, and fresh salads! I love stopping in here right before check out to grab my favorite morning drink, an almond milk latte. Click here to see their hours of operations. CLUB M - Club M is very diverse in the sense that it offers DJs, live music, and dueling piano shows. Click here to check their hours of operation, the list of this moths entertainment and to reserve a table. AFTERNOON TEA - Every weekend the Fairmont will host an afternoon tea in the beautiful lobby and library area. Enjoy music and a pot of tea or a glass of wine with finger sandwiches, scones, and pastries. Click here to see hours of operation and to make a reservation. POOLSIDE - Agh yes. Always the first stop after we settle into our room. We have to take advantage of the weather OBVIOUSLY. It's bar is perfectly paired with the best day drinking and post swimming snacks such as snacks, fresh fruit, ice cream, salads, sandwiches and grilled favorites. To see the hours of operation for the pool, bar and kitchen, click here. IN-ROOM DINING - As much as I love sitting out on the terrace at Amaya or at the bar top in the lobby lounge next to the fire, there's something insanely fun about being in my room with my balcony doors slid open, sitting in my robe, drinking a glass of wine while my boyfriend and I search for something to watch and wait for our dinner to come knocking at the door....ya know?! One time we ordered a bottle of champagne to the room and of course that was fun. It's just for when you feel like being SUPER relaxed ya know! The customer service is amazing and it is available 24 hours a day and gives you everything from hearty comfort foods, tasty light meals and signature gourmet dishes. Duh. I don't know why you wouldn't want to hang out here all day. Eat, drink, swim, sleep, repeat. There's a kid friendly pool which is beautiful, it's actually the one that we hang out at the most (mainly because it has a bar lol) and then there's an adult only "relaxation" pool. That's right, no kids allowed, and there's always a waitress around to come and take your drink order. The freaaaaaaking spa you guys. IS A MUST. It is one of only 60 Forbes Five-Star spas in the world and features an extensive list of services that you honestly just need to check out here because like I said, it's EXTENSIVE. It also hosts the Halm salon to take care of your hair, mani and pedi needs. So if you do book a spa treatment then you need to make sure you get there early because you NEED to experience the spa the right way if you ask me. In order to do that, you have to make use of allll the spa's facilities. Click here for pricing as well as hours of operation for the spa and the salon. I love this gym because it has everything I need! I hate when gyms just have like 2 treadmills and one rack of weights. This gym offers multiple cardio machines and then a full weight room plus flat screen tv's and a new daily fresh fruit infused water option. It is open 24 hours a day, 7 days a week AND they offer personal trainers! All you need to do is make an appointment :) They also offer yoga and fitness classes for hotel guests which you can view here. The stunnnnning Tom Fazio designed golf course stretches out over Los Peñasquitos Canyon Preserve and borders most of the Hotel so if you or your boyfriend are a fan of golf be sure to pack your clubs or rent the latest TaylorMade clubs from the Golf Shop. And if you're not any good then you can work one on one with any of the PGA-certified instructors! Lol, last time I played golf it was a disaster so this could come in handy, or you could just go chill in the club house. (Which is 50,000 square feet by the way...yes please). Complimentary access to select resort amenities such as the four different pools and all of the fitness classes. PLUS MORE. Check out all the perks here. I grew up in SD so I highly recommend giving yourself enough time to leave the beautiful hotel at least 2 times to go out and enjoy some of the fantastic views, people, and food that San Diego has to offer! The Del Mar beach is about a 20 minute drive at most which offers the Grand Del Mar Fair and the Del Mar Horse Races over the Summer! You also have some amazing restaurants at the Del Mar Plaza where you should definitely go if you're looking to do a little appetizer and wine hopping. That's for sure one of our favorite things to do because you get to experience so many different drinks, meals, and environments while not being far from the Hotel and you can easily walk to each individual restaurant so you don't have to worry about getting Uber's all night. On Saturday's you could go spend the afternoon at the Del Mar Farmer's Market or you could head over to Dog Beach at any time if you have your pup with you! There's also some great hikes in the area:) The Torrey Pines State Extension is probably my favorite within that area because of the view but Crest Canyon park and San Dieguito Park are also amazing. Downtown San Diego is about 25 minutes away if you want to go walk around little Italy or the Gas Lamp, or go to Petco Park. I personally love the Harbor area downtown because the bay is absolutely beautiful and there's a lot of restaurants that over look the water so if you have time then jump down there for a least one night! I can't say enough good things about this Hotel. It really is my favorite place to escape to and I absolutely love bringing friends and family over while we stay there. It would be the most amazing venue if you are looking for a place to get married or if you need a birthday weekend thats fun AF but not quite Vegas. Lol. These crab and corn fritters from the Club House were INSANE. Highly recommend! OBSESSED with these shoes, they're from Steve Madden, skirt is from LF, and purse is from Veggani.